If you’re a data analyst, you probably believe in the power of data to make better decisions. But believing that yourself is different from inspiring that belief in others. The real challenge is inspiring others to believe in this, too. Of course, every challenge is an opportunity. As a growing analytics team within Intercom, advocating for the effective and creative use of data is a significant focus for us. It’s as important as spending time on our own technical proficiency. Our ultimate goal is to help teams make informed and effective decisions using data, so we can build better things, faster. Framed this way, building strong partnerships across the company and telling compelling stories with insights are as important as the skill and time it takes to generate those insights. If you work in product, you are making many decisions each day about the product you are building. Effectively partnering with your analytics team and learning when and how to incorporate data into your decisions will ultimately help you build a better product. This was the theme of a talk I delivered at our recent Building Intercom event. You can watch the talk below or keep scrolling if you’d prefer to read. Set up: This is about deeply understanding the problem & thinking about a solution from first principles. This is big picture thinking. Solve: This is taking that big picture solution and scoping it down to the smallest coherent product that potentially solves the problem. We then ship this “first solution” to beta so that we can learn and iterate. Close out: Once we’re confident that we’ve arrived at the ultimate solution that solves the problem, it’s then finalised to get it ready to ship to all customers. In my experience, analytics at most companies is focused on the “beta” or “evaluate and close” stages. However, many decisions are made before product is shipped to customers. Product development is continuous decision making. Although they might seem like small decisions at the time, each decision that you’re making is potentially taking you down a different path. A different path, in this case, is ultimately a different product. It focuses minds by establishing what you do know and what you don’t know. You can make better decisions because everyone has the same information in front of them. It sparks creativity. When you’ve been working hard on the same project, the same problem, week in, week out, it’s hard to see something in a new light. But data can bring new information into the room. It can make people think about something differently. It can shake things up. It can encourage participation from the whole team. Common ground and new information encourage participation from the whole product team. This results in better, more collaborative, decisions. But getting to this place – where you are building with data throughout the development process – isn’t something that you can be prescriptive about. One day, you don’t just announce, “We need to use data in every single decision that we’re making.” As an analyst, you need to understand how and where decisions are being made and you also need to know the best way to share insights with your team. Throughout my career and my time at Intercom I found there are two things that have been impactful to help make this happen. When I first started at Intercom, we were working on a project that every customer and every customer’s customer was going to see – a complete overhaul of the Intercom Messenger. They’d been working on this project for quite a long time, and the team had this list of thoughtful but specific questions they wanted to ask of the data. But I was so eager and excited about other ways that analytics could help – I had different questions, new questions. The problem was I hadn’t worked with this team before. A lot of people have experienced this feeling, of coming into a new company or a new team and trying to have immediate impact without enough context to succeed. I didn’t understand what was important to the team, the decisions that had been made in the past, how they thought through problems, even the emotions in the room. As the launch approached it was a fairly stressful time. The team didn’t understand how I worked either. To get to a place of shared context you need to build strong partnerships with your team. Partnerships take time. They’re nuanced. They’re personal. But it’s so important to take time to empathize and connect with your colleagues. One thing that works well at Intercom is for analysts to be embedded a certain amount within the relevant product team: attending some of the team’s weekly meetings, going to design reviews, sitting with the team for certain important days around launch. Being at design reviews is helpful because it gives me a better sense of how and why decisions are made. If a decision is being made where I feel like I could add something, we have some insights, I can do it there and then. Even simple things like being in the internal Slack channels is helpful. It allows you to understand the dynamics of the team, people’s favorite emojis and it allows me to share data in a much more informal way. Taken together, this allows us to move really quickly. Storytelling involves creating a thoughtful narrative around the data that you’re sharing. It’s the idea that the data you analyse is only as good as the story you can tell. If an insight isn’t understood and isn’t compelling, no one will know how to act on it and there will be little impact from your work. Some of the most impactful work that I have done has been built from very simple analysis. It’s the storytelling or the visualisation that can have the biggest impact. Equally complex and interesting analysis has landed flat when I haven’t spent the time to craft a thoughtful story. I recently did a piece of analysis to understand how our customers worked in our inbox. We were deep in the design phase for a project around creating further automation and efficiency and the team had strong assumptions around how customers were currently working. We believed that each team had one shared way of managing the inbox. 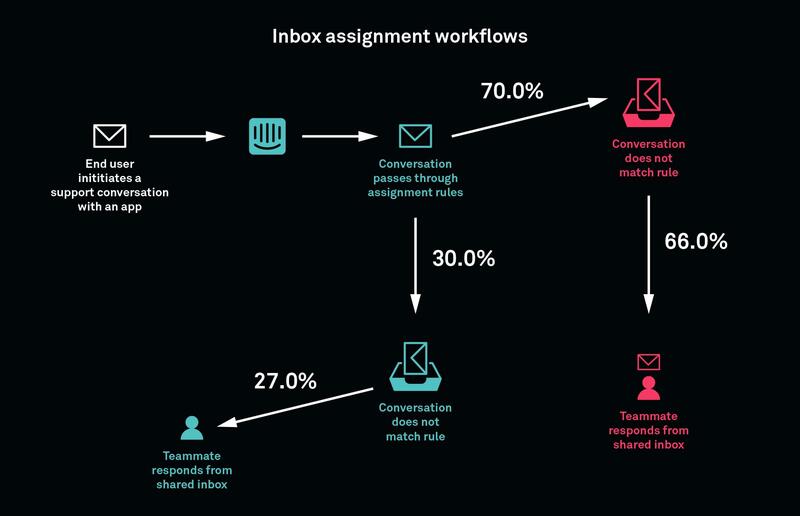 My analysis showed that there was actually multiple ways that teams worked in the inbox – very different to our initial assumption that there was one shared way. I was so eager to share this with the team that I immediately threw the numbers into a scrappy but dense report and sent it over. It sat there gathering dust. You can tell these things. You can check on Google Drive when nobody looks at your report. There was no clear story. What did these numbers mean? What should the team do next? There was a real risk we were going to start this project based on a wrong assumption because I hadn’t bought the information to the table in a clear way. Round two: I went back to the drawing board and crafted a story from the data. It was just a simple visual representation and it clearly showed there’s more than one workflow. It was a success this time. The team printed this out. We had it on the wall in our room. The insights were the same, but the story made the difference. Now we could all agree that there was multiple workflows for how our customers manage their inboxes. We were able to start on the right foot. We had this common ground and we were going off on the right path. Product development involves continuous decision making, and data can help you anywhere that you are making those decisions. It’s not just useful after you’ve built or shipped product. In my experience, the two most impactful ways of using data throughout product development are by building strong partnerships and telling a compelling story with data.